All the same, life in the woods in springtime offers revelations I can't imagine arriving any other way. There's nothing quite like venturing out with my children Cecilia, Andrew and Natalie to check their apple tree saplings as they grow buds, then leaves, then tiny red blossoms, still coiled tightly today but ready to burst forth. Yesterday my children caught their first neon-orange newt of the New Year, and then spent the next hour catching tiny flies to feed to it. Yet it's the sounds that startle me with their springtime lust for life. There's the astonishingly loud, echoing pounding of the woodpeckers hunting for breakfast in the bark of old trees. This morning I heard the deep, rhythmic flapping of geese flying low over the metal roof of our cabin. And of course, this being near Cooperstown, we have the THWAPPP! of baseballs and softballs hitting leather gloves, or clinking off aluminum bats, as my two older children acquire a growing love for our National Pastime. But it's at night, when human sounds quiet, when I feel totally at one with spring. There are owls hooting, nocturnal critters scurrying and the occasional coyote baying at the moon. And then, if I stand still, I hear a slow but sharp sound like the crinkling of paper, or a small waterfall maybe. It is tiny new plants, new life fashioned into green spears of fresh growth, forcing their way through last year's old dead leaves. Sometimes, in the light of morning, we can see the shoots of this new life stabbed right through the old. 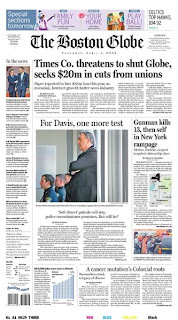 It's nice to see The New York Times has decided not to shut down The Boston Globe after reaching deal with the unions. I guess that's good news. Yippee. But I can't shake the feeling that we're in a whole new phase of the destruction of the newspaper industry when we are cheering that one of the nation's oldest and best papers, based in the hub of an amazingly vibrant cultural and economic region, has earned a reprieve from the guillotine. We all know the blade remains sharp, and ready to drop on any one of us next week, next month, next year. If the economy really recovers perhaps we can begin to understand how much of the recent wave of layoffs and newspaper closures is cyclical and how much is structural. Obviously it has been an evil combination of both until now. But I think we all know that the long-term prognosis is dire so long as print revenue keeps plummeting and web revenue stays so thin. And I'm getting sick of the lazy assumption that we all were simply too stupid to adapt to the tidal wave as it loomed on the horizon. Just about the smartest journalist I have ever known-- Steve Coll, he of two Pulitzers, the New America Foundation and New Yorker staff writerhood--spent the late '90s and early '00s trying to see the future during his previous incarnation as the managing editor of The Washington Post. If he couldn't figure it out before it arrived, I'm not sure any human could have. So what's left to do? I wish I knew. I hate the idea of walling off the news business behind the money of private foundations, no matter how well-intentioned. All money has strings, and in a way pure profit motive--money freely given in exchange for a service--is actually the most straightforward ethically. Is there a way to make money on the web? Can this idea about charging tiny amounts for each story work? It all depends on how much the public decides they value what we do. In that narrow way, maybe the scare over the Globe's possible death has been a wake-up call to us all. If our nation values its newspapers, they are going to have to decide they are worth saving, which means somehow paying for them again. For years, the surest way to get me to lose my reporter's cool was to accuse a newspaper (especially one I was writing for) of printing a story "just to sell papers." This irritated me not only because I'm a journalist, the son of a journalist and the brother of a journalist but because the people who ran newspapers were, so far as I could tell, pretty bad at trying to sell them. When was the last time you saw a story on Britney Spears or some new magical wrinkle cream on the front of The New York Times or The Washington Post, or even in their small-town equivalents? The hundreds of people I know in the newspaper industry did the job because it mattered, or they (we) thought it did. We always delighted in challenging power, to use the old catch-phrase, comforting the afflicted and afflicting the comfortable. However much that may have satisfied the soul, it was not exactly a prescription for printing money. By and large, we simply were not populists. Newspaper publishers seemed to know this, and instead relied on non-journalists to make money, which was not terribly hard in the days when newspapers were the only broad-based source of real estate ads, classifieds and sports scores in any given city. The news, from a business point of view, probably always came second, and to the extent journalists were crucial to selling newspapers, it was the slow accumulation of credibility that was our most important contribution, not a single sensational story. But while the much-mocked "bean counters" made money, we were free to spend it by pursuing what we imagined were social goods: telling the truth, no matter how uncomfortable it often made the powers that be, or even our own readers. We were insulated. We were naive. We were innocent. The wave of newspaper closings and layoffs has, I fear, begun to change that forever. The New York Times, of all entities, is threatening to close The Boston Globe, which was for decades one of the best around, and probably THE best for its market size. Meanwhile The Baltimore Sun, where my father worked for parts of four decades, and where both my brother and I spent time on our way to bigger places, has been gutted beyond recognition. Check out this terribly depressing account by my old Sun friend Dave Ettlin for the gory details. If I've got this right, The Sun's newsgathering power has declined by more than half from wave after wave of cuts. After you make cop calls or keep up with the Orioles and Ravens, and maybe attend a City Council meeting, what exactly do you have the horses to do? Having spent years overseas, in places that were short on serious, reliable sources of news, I can tell you that their absence undermined serious debate about just about everything. So if we ever recover as an industry, I can't imagine we'll recover that essential spirit of reckless disregard for the economics of selling news. 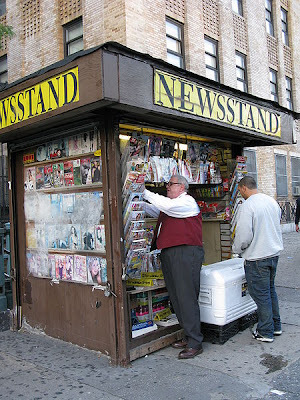 We all now know, in our guts, what it means when we don't sell papers. And while we've lost our innocence on this, there's little sign this obliviousness to the bottom line is built into the ethic of the webosphere. (About halfway down this David Carr column in the Times, see an appalling account of attempted news profiteering by a blogger at the Huffington Post.) Every click of a reader’s mouse generates data on what’s a hot topic that day. Simply having all that information operates as a kind of vast bio-feedback mechanism that makes it impossible to ignore the preferences of readers, for better or worse. No reader survey ever could come close to what web diagnostic tools tell newspaper editors every day about what might make their product sell better. That doesn't mean you'll see stories about Britney or miracle skin cream any time soon on the front page of the Post or the Times. But the new world of free, easy media access has totally rearranged the incentives. A steady accumulation of credibility--of being right, or as close as possible, day after day after day--is worth less and less. The essential stodginess of newspapers, perhaps of serious news itself, seems to be a fatal flaw in an age of constant, rapid-fire sensation, stimulation, entertainment. The next time I hear somebody say, "They're just trying to sell newspapers," I will reply: "I wish."